Monterey County — a large coastal county in central California — is well known for its diversity of birds (e.g., Roberson 2002), but rather little known for dragonflies. Tim Manolis wrote in July 2006: "Monterey has certainly been undersampled, at least based on what specimens are to be found in major statewide collections. My specimen data base of close to 10,000 records for California contains only 41 specimens of 23 species for Monterey!" The obscurity from an odonate point of view is changing. As we embark on the acquisition of new information, it is well to look back at our history. Kathy Biggs has recently placed on-line "A Short History of California Odonata" and it seems worthwhile to also review the history of local odonata. I divide the history of Monterey odonata into 3 periods: a distant past, centered around collections at Hastings Natural History Reservation; a quiescent 60 year "regency" period (1944-2003), and then the present (and future). Information on the Hastings NHR collections came to light only in 2006; this is actually "new" information that was not known to Tim Manolis when he wrote of MTY's "undersampling" in July 2006. It is possible — even probable — that some of what is set out below is incorrect, and that other historic information will still come to light. Corrections are welcomed. ACKNOWLEDGMENTS: Walt Koenig and Mark Stromberg at Hastings provided essential information about the odonate collection that is now housed at the Oakland Museum. Thomas Steller, curator of that collection, graciously provided access to Tim Manolis, Douglas Vaughn, Rita Carratello and me in Aug 2006. Tim Manolis and Dennis Paulson went well beyond the call of duty in supplying information from their own personal files. Details and/or photos for specific records were graciously provided by Robert Behrstock, Tim Cashatt (Illinois State Univ. ), Rob Fowler, John Hafernik (S.F. State Univ. ), Paul Johnson, Bill Mauffray (Florida State Univ. ), and Steve Rovell. I thank Tim Manolis, Dennis Paulson, and Dave & Kathy Biggs for their encouragement throughout this project. Beyond a single specimen collected in 1919, the first interest in MTY odes was at Hastings Natural History Reservation, a U.C. Berkeley research station in upper Carmel Valley. Between 1938 and 1943, the Hastings director, Jean Linsdale (left) and his son Don collected a wide variety of insects at Hastings. 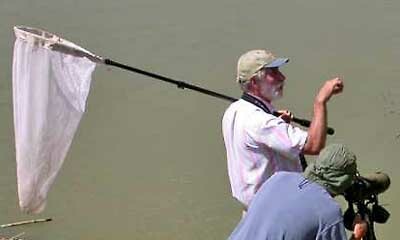 Among them were 15 species of Odonata. Research interest in Odonata at Hastings was reawakened in the 1980s when Walt Koenig & crew (right) undertook a series of project on the ecology of Common Whitetail. The old Hastings collection was left mostly uncataloged and in poor condition until it was transferred to the Oakland Museum in the 1990s. This web site and a few prior publications are the first use of the information in the collection. In all, 16 species were added to the MTY checklist during this period but at least 5 of them remained unknown until 2006. During this quiet 60 year period — aside from the research at Hastings in the 1980s — the only folks looking for odes in MTY were the occasional visiting scientist or naturalist. 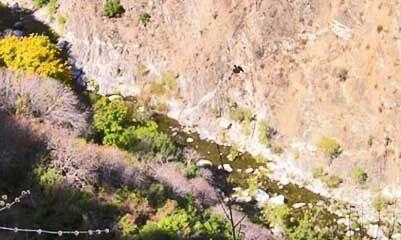 Many of them stopped along the Arroyo Seco River (right) at or near Arroyo Seco Campground, a local hot spot for odonate diversity. Ten of the 17 species added during this period (nearly 60%) were from here. 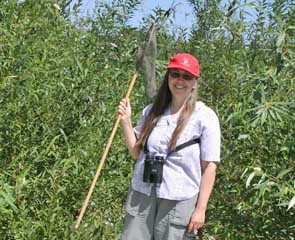 Several 'big names' in odonology were among those contributing species to the local MTY checklist, including Dennis Paulson (left; in a 2005 photo from Texas), Robert M. Bohart (for whom the Bohart collection at U.C. Davis is named), and B. Elwood Montgomery, an entomologist from Indiana who collected San Francisco Forktail back in 1949, a species that now appears to be locally extirpated. Some 17 species were added during this 60 years (an average of a new species every 3.5 years), bringing the MTY checklist to 33 species. The dominance of professional entomologists and their collections as the primary reference point for MTY odes would change with the publication of Tim Manolis' field guide to California damselflies and dragonflies (Manolis 2003; the photo of Tim is from 1972). 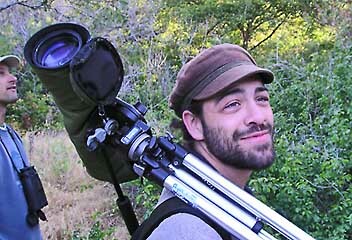 Tim was already well known in field ornithology. 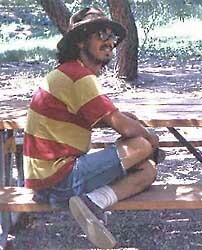 His guide made ode-watching accessible to interested local naturalists — many of them birders — and was supplemented by new Internet resources: a CalOdes listserv on Yahoogroups; Kathy Biggs's web pages on identification and distribution; and Odonata Central at U.C. Texas, with its potential for on-line contributions from amateurs. Since the publication of Manolis (2003), a dozen species have been added to Monterey's checklist. This is a rate of 4 a year during 2004–2006, or a pace 14 times greater than during the previous 60 years. What accounts for this is the interest of local amateurs. 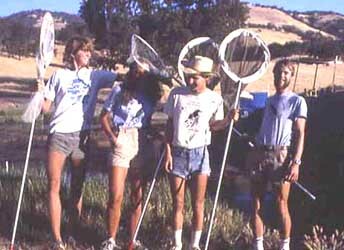 The first was Rob Fowler (left, with scope), an intern in summer 2004 at the Big Sur Ornithology Lab, aided from time to time by his friend Steve Rovell (far left in photo). 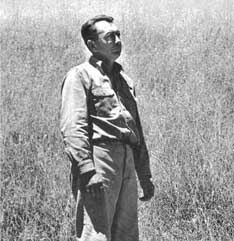 In 2004 & 2005, they added six species, and Paul Johnson, naturalist at Pinnacles Nat'l Monument in adjacent San Benito County, added another. Most of the additions were sight observations but most were upgraded to full photo-documented status by the end of 2006. Five more species were added in 2006, when Don Roberson & Rita Carratello (right) became interested. 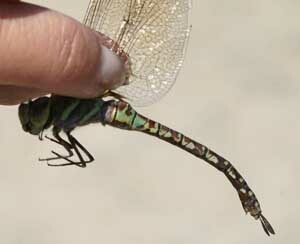 Another recent addition — Paddle-tailed Darner — was found by visiting Ohio birder William Hull. Don, Rita, and/or Paul Johnson added 3 more in 2007. In addition to new species, much new information about local status and distribution has been learned. With new enthusiasm for this subject, the future looks very bright. During the last 3 years, 15 species were added to the MTY checklist, bringing the county total (as of Nov 2007) to 48 species. All photos documenting species on the checklist are on file with Odonata Central, Univ. of Texas, and the identification has been accepted by the California experts assigned by that project. These experts have also vetted the identification of specimens cited. Manolis, T. 2003. Dragonflies and Damselflies of California. Univ. of Calif. Press, Berkeley. Roberson, D. 2002. Monterey Birds. 2d ed. Monterey Pen. Audubon Soc., Carmel, CA. Many of these sites have links to other useful pages. Kathy Biggs's site is particularly useful in her selection of links.